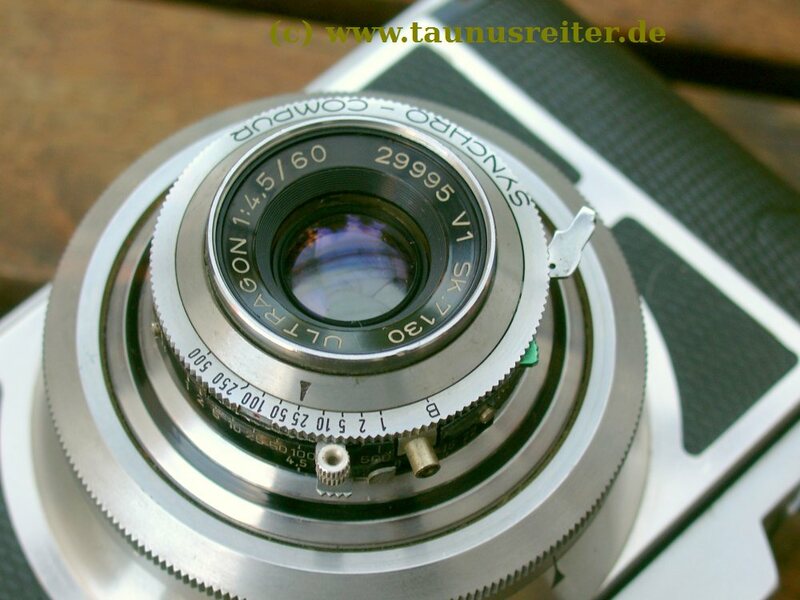 11st June 1952: Albrecht Wilhelm Tronnier claimed patent on a 6-element wide angle lens with 75° angle of view and faster than f/5.0 (DE1042264/ US2730015). Tronnier then was a freelancer with Voigtlaender Braunschweig and cited from his own invention of the ANGULON, also a symmetrical 6-element-lens, made 22 years before when he was Technical Director at Joseph Schneider Kreuznach. The new lens was claimed to be faster, better corrected for aberrations (especially at the picture edges) and has a larger image circle or angle of view. Tronnier, working in Goettingen, 70 miles from Braunschweig, master of logarithm boards and mechanical abacus machines in the pre-computer era, also invented the Xenon, Ultron and Nokton lenses. Based on this patent - therefore probably not much later (hardly earlier) - VOIGTLAENDER launched its first and only Large Format (LF) wideangle lens, the ULTRAGON in 1:5.5/ 115mm (calulated for 5x7 inch image area). For smaller image circles, i.e. 120 roll film (6x6 or 6x9 cm) this wasn't offered, although the compact Schneider Angulon 1:6.8/65mm was still in the market, which results were just avarage if not stopped down 3-4 f/-stops. Moreover, there was the brand-new Biogon offered by Zeiss (calculated by L. Bertele), with even wider image area (90°), though substantially larger, more heavy and not usable with most low weight or travel cameras. different to the Heliar or Apo-Lanthar. It would have been a nice addition in the Voigtlaender LF lens programm, which was part of production until factory closure in 1972. There even was a prototype camera with a 1:4.5 f=60mm Ultragon lens, a Bessa-I conversion with focusing mount (1.5m - infinity). At 6x9cm (Roll film type 120) this corresponds with 79.5° angle of view or 26mm wide angle at 135 film format. The nearly symmetrical lens is mounted in a (very small) Synchro Compur 000 size (smaller than Angulon 1:6.8/68mm which fitted 00 size). Top plate and simple tunnel view finder kept unchanged from Bessa-I, so there was need for a foldable mirror finder (similar to the Brilliant cameras) mounted on the accessory shoe. 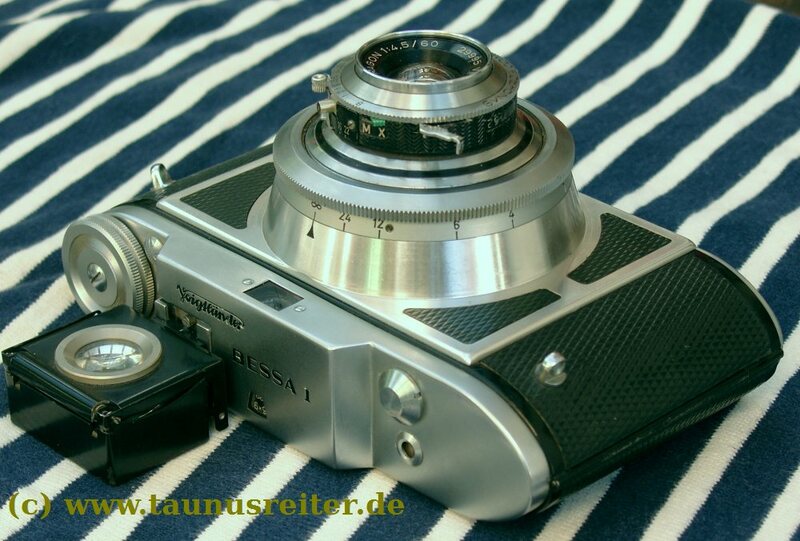 Without folding mechanism of the Bessa, the release mechanism with trigger on the top plate wasn't possible, so the leaf shutter is triggered by its own lever. In general, the prototype looks quite well finished and not like a quick conversion work. 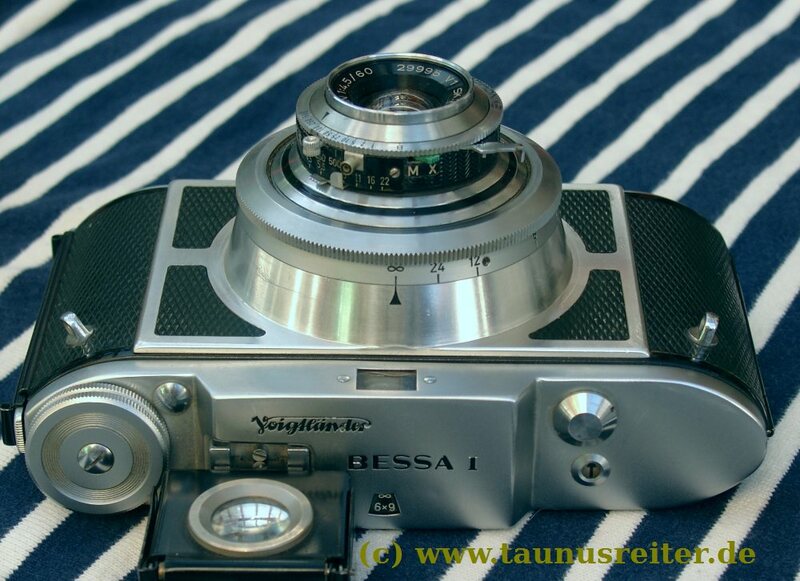 Leatherette and eyebolts are different from the Bessa. With altering the top plate, including a brightline finder according to the image field and a trigger mechanism this camera could have made its way to production. Instead of the (always slightly wobbly) folding construction - resulting usually in unsharp edges at least - there was a very solid constrution with nearly zero play, like with the best small format cameras made of 100% metal. The Ultragon was, as pictures show, a very small, compact wide angle lens. It would have been a great addition to travel cameras with a lens plate unable to carry a large Biogon or Super-Angulon, or (like the Graflex) which can't be closed with a large lens mounted. For these cameras there was no modern offerings, so photographers had to use outdated designs of the 1930's. And even 50 years later photographers kept asking for a smallsize wideangle MF camera capable of taking high-res landscape pictures. Here it was. And it wasn't taken to market. In 1956 Voigtlaender was overtaken by Zeiss, maker of the Biogon, and model programm decisions were made by Zeiss effectively. No wonder that the ZEISS Biogon was offered in 21mm (small format/135 film), 38mm, 53mm, 60mm (Medium formt/120 film), 75mm (4x5 inch) focal length - and Voigtlaender Ultragon just for 115mm (5x7 inch). 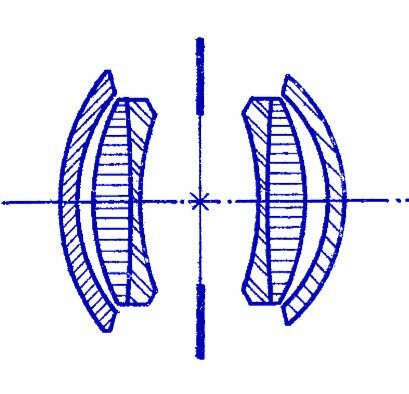 With its smaller size and building effort the 6-elements-lens probably would have been even lenss expensive than the large Zeiss Biogon. 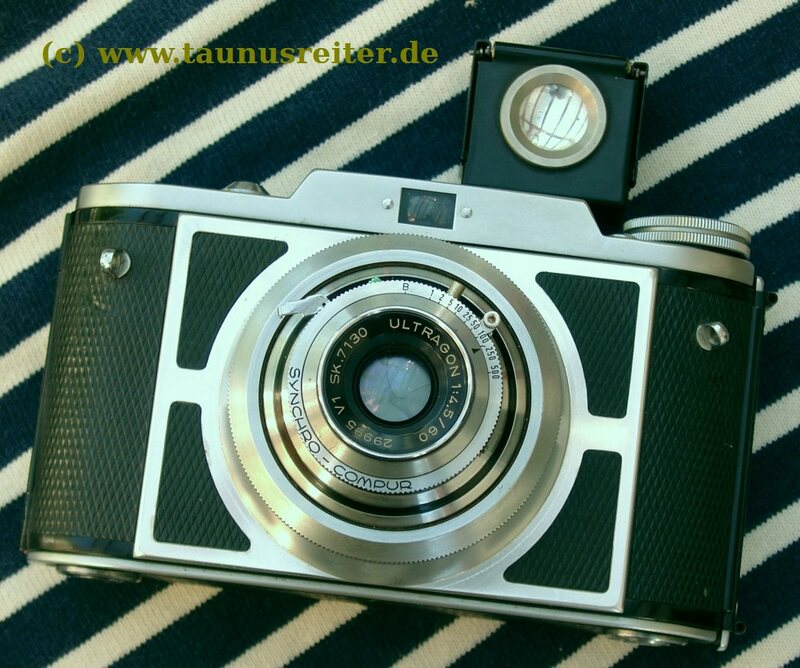 What a pity for the nice Ultragon lens - and what a pity for Voigtlaender, subsequently! Pitures with the 60mm Ultragon - will follow!